On one hand his stint with Ipswich Town is categorised as one of the biggest flops in Premier League history. On the other hand he was once regarded as the best winger in the world. 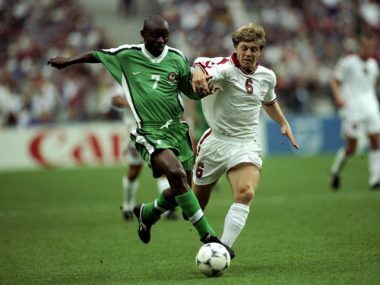 Finidi George, together with compatriot Nwankwo Kanu, came to prominence during his time at Ajax in the mid 1990s. Although he was regular starter in Louis Van Gaal’s Champions League-winning team, unlike Kanu, it was his time at Real Betis that would see him produce the best football of his career; notching double digit goal figures in all but one season at the club. A mercurial talent but undoubtedly gifted, a certified member of Nigeria’s Super Eagles team, and capable of conjuring this kind of out-of-nothing moment.